Summary: Unfortunately wet today with showers on and off. 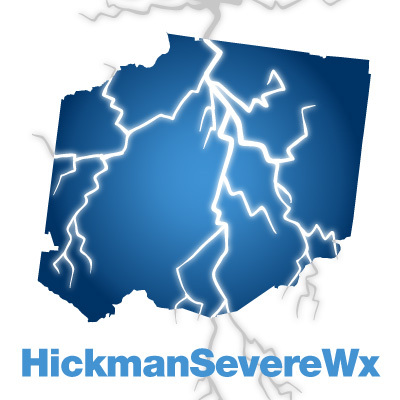 Return to work looks a little dicey with severe weather possible. Rain the rest of the week. It’s currently very wet outside as we get started on our Memorial Day holiday. 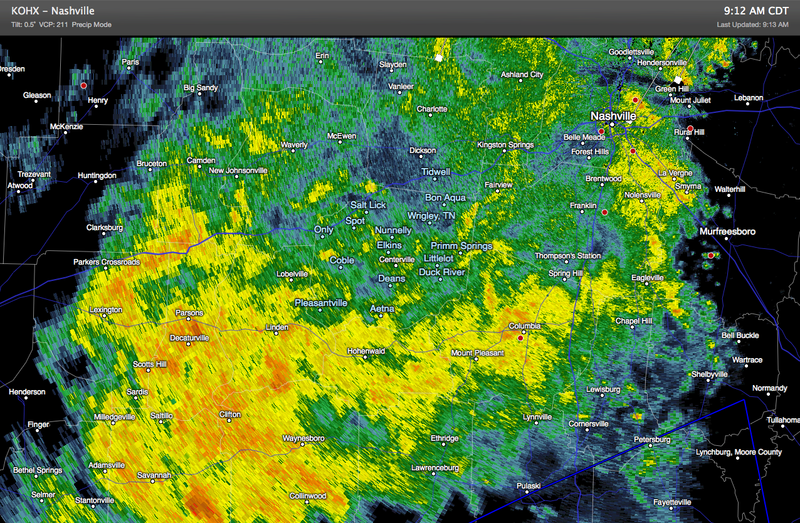 Here’s the radar as of 9:17am this morning. Not the way you want to start of a holiday. Today, expect a high temperature of 78 degrees with an 80% chance of rain mainly before 1pm today. Winds will be out of the south at 10 to 15 mph. Unfortunately, HRRR is showing the rain will likely stick around until about 3 to 4pm, so have an indoor plan for your festivities (I know, I said it wouldn’t a washout yesterday – but there was more moisture in the air for these showers than there were forecasted). 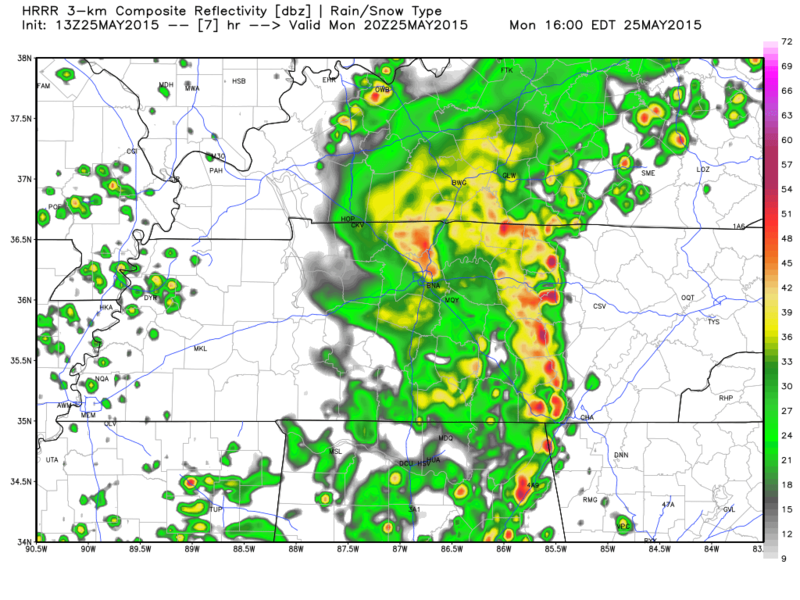 Here’s HRRR’s simulated radar loop from 8 am this morning to 10pm tonight. For a closer look, the rain might leave out by about 3pm-4pm. While this rain doesn’t have any rumbles of thunder in it, later today these showers could strengthen enough to put down a little bit of lightning. Tonight’s overnight low will be 67 as rain chances drop to about 40%. We are watching Tuesday for a SLIGHT chance of severe weather. Tuesday’s high will be about 79 degrees with a 70% chance of rain. Winds will be out of the south at 10-15 mph with gusts up to 20 mph. The Storm Prediction Center has outlooked us for severe weather under their SLIGHT category starting Tuesday at 7am through Wednesday at 7am. This means they believe we have a 15% chance of seeing severe weather within 25 miles of a point. Main modes of severe weather expected (in order of severity): damaging winds, some hail, and a possible tornado or two. The models aren’t really in range to show us much of what could be yet. However, if there are morning showers and storms, and these storms as they either fall apart or move out will destable the atmosphere, reducing the severe weather threat. If there are no morning showers, the atmosphere will become unstable and showers and storms could develop in the afternoon that could be severe. There is no need to be overly concerned about the severe weather chances, but it is worth keeping an eye on as we return to work on Tuesday.